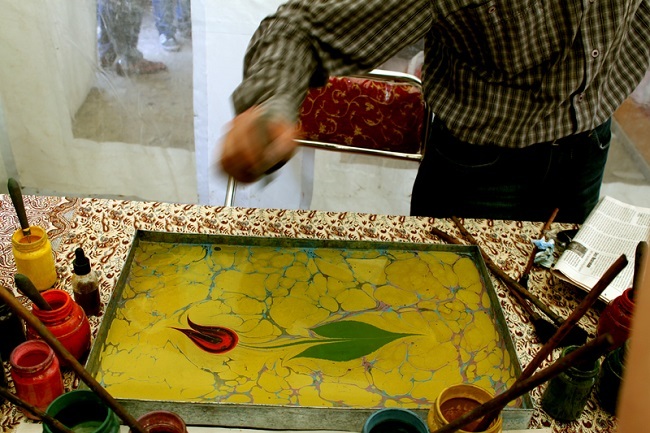 The ebru technique was originally used to create paintings, but nowadays there are certain artists who perform ebru painting as a form of spectacular live performance. Below you can learn about the origins of this fascinating technique, and also take a look at how it's used nowadays. The ancient art of ebru painting has East Asian roots, but further developed in Turkey, where it was used for making colorful paintings. Nowadays, it's also commonly used for silk painting and is even popular as a form of performance art, when it's painted in live and shown on a projector to the audience - usually accompanied by music. The technique of marbling was first used in the early 800s in China, where they put just a few drops of ink onto the water's surface, then repeated this until they got some concentric circles or other interesting patterns. They preserved the smooth and lively texture by carefully placing a paper onto the water's surface, and as the paper drank up the ink, the pattern remained on it. Ebru had developed largely in Turkey, where artists used a similar method to create a wide variety of colorful motifs - ranging from abstract patters to floral images. In Turkey, the marbling method was not only done using paper, but artist also painted silk this way, which they could use as garments later. Even nowadays ebru painters on the streets of some Turkish cities are a common sight. They usually paint more or less traditional motifs, and the majority of tourist just love seeing how their paintings are made. Another incredible - and more modern - use of this technique is when it's painted in live onto the surface of the water. The water is filled into a transparent box that's well-lit from below, which makes the already beautiful and vivid colors even more eye-catching.